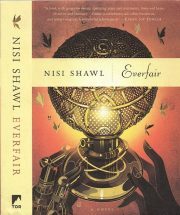 Although Nisi Shawl has been publishing short-form spec fic and related non-fiction since 1989, 2016’s steampunk novel Everfair is her debut novel. Confronted with ultimatums from Leopold’s heavily armed Force Publique , King Mwenda’s least bad choice is to buy time with apparent concessions. He and his Queen Josina hope to use this respite to out-think the Europeans while searching for new weapons in the struggle against the invaders. 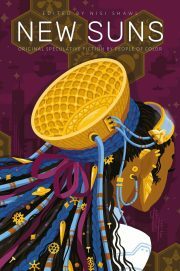 Enter the idealist colonists of Everfair.